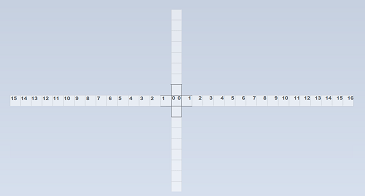 Is there any way to scale that ruler? I downloaded and read through the help and played with it a bit but I don't see anyway to scale it. I do that with the ruler Young46 uses by changing the script but don't see any way to change this one. You can click it and it makes a red line to measure the flag. I just double and triple it for 20 and 30 yards. Ok - I see. Thanks. The flag has a tendency to change size during a round n based on camera view. 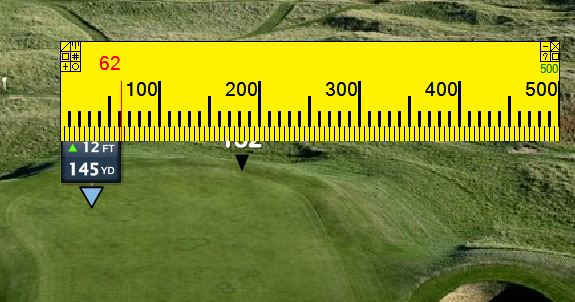 the scale does not matter... if it measures 7 or 67 so if wind is 13mph offset aimpoint u r looking at 1.3 x flag size. For either 9.1 or 87.1 at least that is what i would try. In my case, I use the ruler as Young46 does which is always based on the view from the player and the ruler effectively sets the angle (not distance) in this view. The scale is set once in the script based on the screen resolution (matching to the aimer size in the player view). Only if I use a different screen resolution do I need to change the script. Even so, I do have a seperate cell in my spreadsheet to change the specified ruler measurement if I use the other screen in my setup - basically like you described. It is a one-time change for playing on that screen. I also have a separate output for ruler setting if I am using full spin, either top of back, since it reduces the actual drift in flight. Rulers are a handy way to account for wind drift. It still makes no difference - the ball usually ends up twice the predicted offset away, lols! That is why to conquer the side winds an in depth statistical variance analysis with coefficient cloud reference tables must be the answer - the skeleton project has already been documented in these forums, I know exactly how to go about it but I doubt it will ever be completed. This is scaled to 1". I don't really see the need for any other scales. I use this on the fairway also for high winds. I have to use a calculator to figure out the extra to give it, sometimes as much as 45%(STA). I do it with 32MPH X 145% = 46.4, thats how much I have to move the flag.